Well, here it is again - The new year. 2012 instead of 2011. This is a repost of lasts year's new year's resolutions entitled Making Mistakes. As I was rereading this post, at first I thought that I hadn't done so well because I still wasn't realizing success beyond my wildest dreams. Aren't we all too hard on ourselves? However, I did accomplish one key goal - A written plan. I took a course at our local college where the big final project was a business plan. And I got an "A" on it, too! (patting myself on the back). Eleanor Roosevelt once said, "Learn from the mistakes of others. You can't live long enough to make them all yourself." I suppose that's true. With 2011 coming quite soon, and with the rush of the Christmas season behind me, I find myself becoming quite introspective. Since I made plenty of mistakes in 2010, I plan to learn from them - might as well make good use of them since they're already made! One mistake I made was a lack of planning. I definitely had lots of good intentions but without planning, that's what my dreams remained - good intentions. Oh, flying by the seat of my ample pants served me well enough but had I converted my 2010 resolutions into written-down plans, success beyond my wildest dreams would not have been so elusive. What does all this rumination and introspection mean? It means that 2011 will be lived on purpose. With a plan. A well thought out plan. A written-down plan. 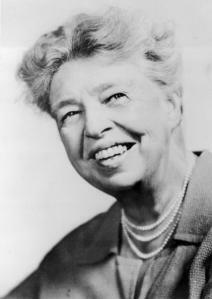 Eleanor Roosevelt also said, "In the long run, we shape our lives, and we shape ourselves. The process never ends until we die. And the choices we make are ultimately our own responsibility."